In a few short weeks my family will be heading to the happiest place on Earth to join Disney Social Media Moms for a one of a kind celebration. 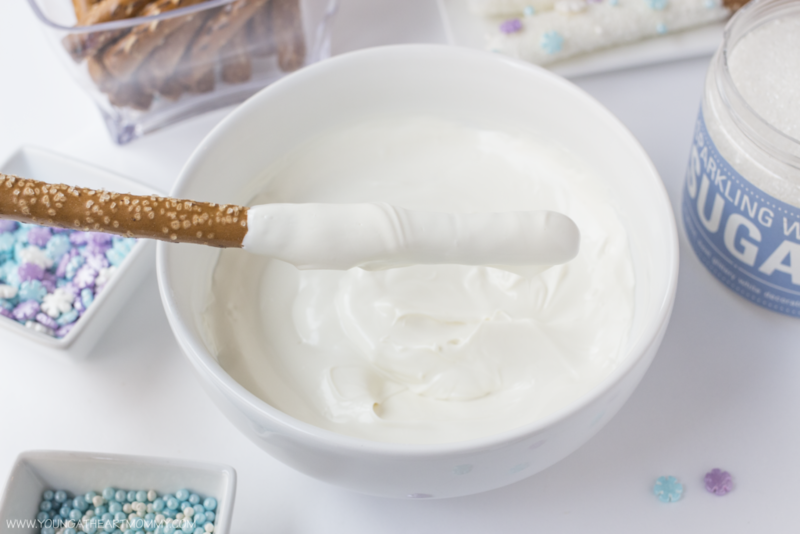 To add a little thrill to the wait, we’re busy finding ways to create magic at home and in the kitchen. With FROZEN still being ever so popular, there’s simply no “letting go” of the excitement for its upcoming sequel in the near future. I think we’re all on pins and needles to see what’s exactly in store for Arendelle and our favorite characters. In the meantime, we’ll continue enjoying the first installment with Ana, Elsa, Olaf, and the rest of the gang. You don’t have to go all out to make movie night special within your own kingdom. 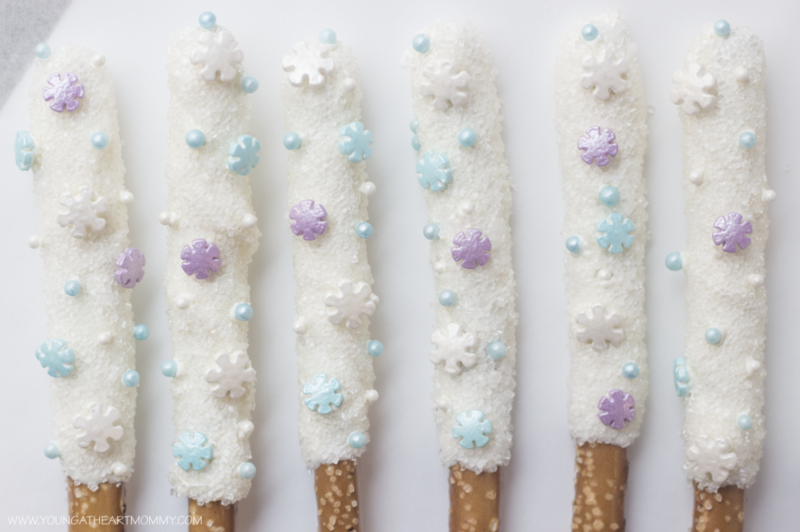 These FROZEN inspired pretzel wands are just what’s needed to make it extra fun for everyone. 1. 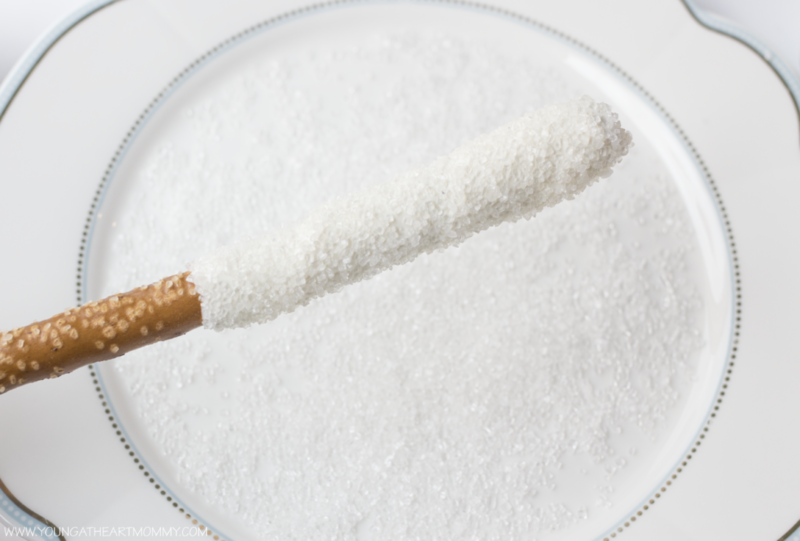 In a microwave safe bowl, heat candy melts in 60 second intervals. Use a rubber spatula to stir chocolate constantly until you achieve a creamy consistency and all lumps have melted. 2. Dip each pretzel rod about half way into the melted chocolate. If chocolate is too thick to work with, add a tsp. of vegetable or coconut oil to loosen it up. Twirl the coated end into the chocolate to ensure that all sides are covered and smooth. Allow excess chocolate to drip off. 3. 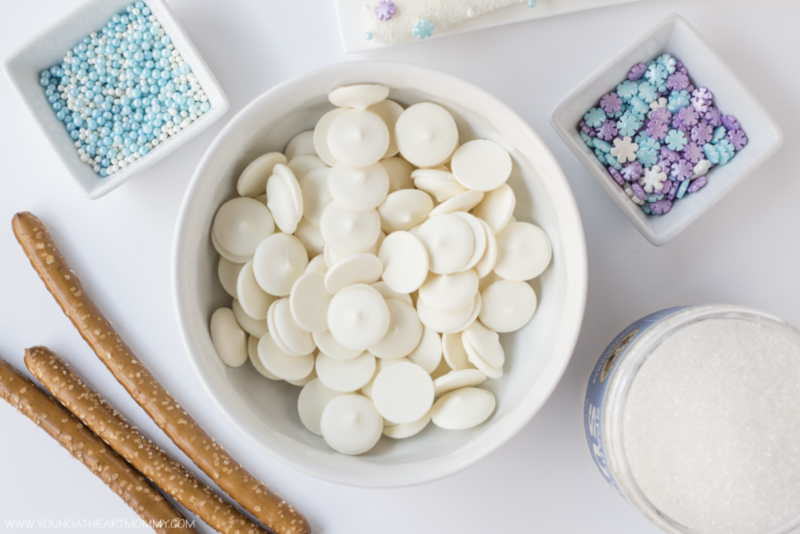 Sprinkle on a generous amount of sugar crystals so all of the melted chocolate is covered. To prevent your pretzels from becoming flat on one side during the setting process, use an empty box of some sort – I used a cereal box. Lay flat. Take a knife or pair of scissors and carefully punch several holes into the surface. This will act as holder and will allow you to stand the pretzels up straight while the chocolate hardens. Just shimmy the un-coated ends into the holes until they feel secure and are not tilting. 4. 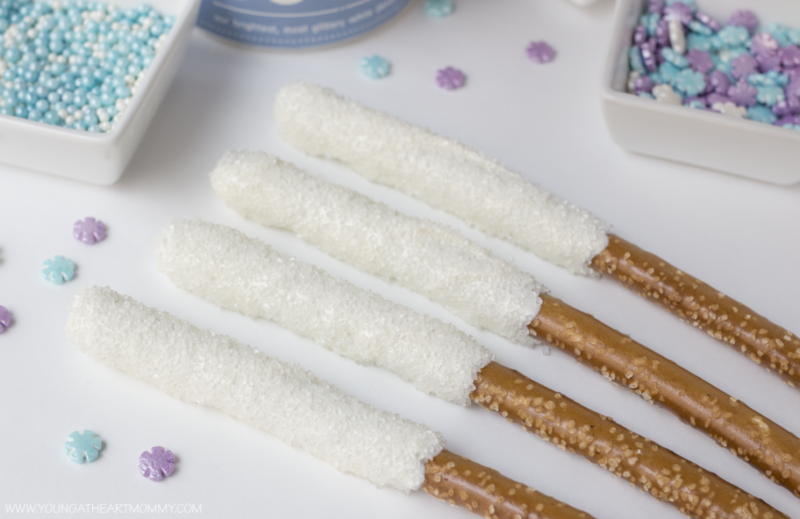 Use a toothpick to attach snowflakes and candy pearls. Dab a small amount of melted chocolate on the back of each, and scatter them on chocolate coated portion of the pretzel rods. Are you excited for a FROZEN sequel? I can't wait for the Frozen sequel! 2017 is going to be such an amazing Disney year! I've done something similar for Madison and she loved them. I love the sprinkle effect on these. I might just have to do this one for Madison since she's a big Frozen fan. These look so cute and yummy! The kids would love making these.